The Archangels Come to Raise Up Chicago! In recent years, Chicago has experienced an increase in gang murders, and despite the efforts of law enforcement, this scourge continues. In answer to the prayers of righteous souls for mitigation, God is sending his powerful angels to deliver an important sequence of messages to counter this darkness and anchor light in the Heartland of America. This September, come to hear the impassioned Voice of Spirit as it speaks to your heart and inspires you to a higher calling and more intimate love of God daily and hourly. Both Chicago and you will forever be changed! Visit our online store for products to help you commune with our blessed archangels! ​Receive a direct teaching from the Holy Spirit, uniquely personal for you. An everlasting grace and individual blessing flows directly to your soul. In-person Soul-Raising Sessions will be available by appointment during the Chicago Autumn Equinox Event. Schedule your session during the event with Joyce Genis. Due to the varying time slots, we are not able to offer online pre-registration. Pay Steven at our onsite Hearts Center bookstore and bring your receipt to your session. You must have your receipt in order to receive your session. During our 2016 summer solstice event, the Maha Chohan, representative of the Holy Spirit, initiated a new cycle and dispensation of healing grace through The Hearts Center movement. 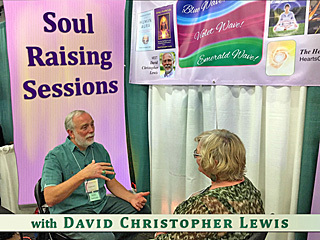 Through this new mantle, David is conducting Soul-Raising Sessions sponsored by the Holy Spirit. The tremendous power of the release of light through the agency of the Holy Spirit will afford you relief from ancient patterns and records lodged in the subtle fields and folds of your subconscious and unconscious mind and being. You will experience change, transformation and elevation. The divine spiritual grace flowing to you will be personal for you. The Holy Spirit will do what she desires in each session. Personal healings are not guaranteed, yet possibilities for healing may come through the Holy Spirit’s divine grace and comfort. By giving the Holy Spirit license to perform this alchemy with your soul, the wave patterns of light released through the agency of the Holy Spirit will be such that you will receive initiatic cycles of light. "Sometimes the anointing, the blessing, the encouragement, the soul raising is facilitated in such a way that you can expand it and help others. That’s what I saw over and over again. It is not just about your own soul raising. You are raised up so that you can raise others up. And that is the magnanimous nature of each one of these blessings. You are consecrated, accelerated, and invested with greater light and fields of divine joy and beingness. I see each person who goes through this as now being even more expressive of their true Self. You have a greater sense of your purpose and mission beyond what you may have humanly conceived you were capable of because God is great and God is great in you. That’s the beauty of these sessions. It reconnects us to the sense of who we truly are as spiritual beings—yes, living in these veils of flesh—and yet still totally connected to God and one with God in our essence, and having all these sacred abilities, resources that we can draw upon, and dynamics of alchemy that we can utilize in our work. It’s so important that you have these sessions. "This was a cosmic experience, something I’ve never had in my life! I was taken right up to the throne of God and shown my divine purpose as a being. I tell you, this changes how you think about yourself! I still get chills when I think about everything I learned about my soul. I can’t tell you how life-changing it is and I encourage everyone to have a session." —C.B. "Once you get the blessing, you will know that it’s not some random blessing that comes out of a hat. It’s really for you. It gives you such a feeling that the Holy Spirit really knows you. You know that everything about you, what you’ve been doing and what your real Self is, God knows, and this communion that you have is undeniably sincere and the truth." —N.B. "Among other things, I was granted a talisman and an ability to bless and raise locations in the Earth and people, and groups of people. I feel that it is something that I will use. And I will continue to develop the ability to use it more efficaciously all the rest of my life. It’s like a life assignment and a grant in a more than ordinary way." —B.B. Chicago weather in September can be very lovely and dry with temperatures between 50 and 80 degrees. The trees will be just beginning to display their fall colors. Techny Towers has a corporate account with 303 Taxi. Rate is per trip, not per person. Up to four people can ride together per trip. Give them the Techny corporate acct. #: 847-272-1100. They will tell you where to meet their taxi. Call to arrange your ride from Techny to airport at several hours in advance of your departure from our event. Choose “Yes” for airport taxi when registering for the event. Enter your flight information where prompted. Approximately one week before the event you will be notified of schedules of those arriving or departing at similar times as you. You can then arrange to ride together. As flights can be delayed and cancelled, have a contact phone number for the person(s) you are planning to ride with. You can always take the taxi on your own if there are flight delays or cancellations. O’Hare has 3 passenger pickup lanes surrounding the arrival level of the terminal. Taxi pickup is the second, or center, lane out from the terminal building. Lodging: Book before Sept 4! If you are looking for roommates, email: lodging@heartscenter.org with your name and phone number. Twelve comfortable rooms are available on a first-come-first-served basis until September 4. Room rate is by occupancy regardless of number of beds in room. Reserve your room with Brad Miller at 847-897-6403. Sheraton provides shuttle service to and from Techny Towers (about a 3-minute drive). Shuttles run from 7:00 am to 11:00 pm daily. Restaurants near Techny Towers Click here! Provided by the Techny Towers Retreat Center.